You'd have to be driving around with your eyes wide shut not to see that 4x4 dual cab utes dominate the Aussie roadscape these days. This surging popularity is largely driven by dual purpose versatility, as their dual cab configuration allows them to serve as a family car and/or work vehicle during the week and a load-lugging escape machine on the weekend. As a result, many of these vehicles end up towing things and they're pretty good at it. A typical 4x4 ute weighs between 2.0-2.5 tonnes with a wheelbase of around 3000+mm, which provides the rock-solid anchorage and straight line stability needed in front of the tow-ball. Add to that the abundant torque and fuel efficiency of a modern turbo-diesel engine and an 'intelligent' automatic transmission with sequential manual shifting when required. It all adds up to a competent and comfortable vehicle for towing, be it a small single-axle recreational trailer or a big multi-axle caravan, boat/car trailer or horse float weighing up to three tonnes or more. Based on our experience, utes with larger capacity engines provide a less stressed and more relaxed towing experience than smaller ones, simply because they don't need to work as hard. Electronic stability control (ESC) is a given in quality utes these days but if it includes trailer sway control on the menu then it's even better. We also look for the shortest distance between the rear axle and tow-ball to minimise yaw movement for greater towing stability. And a reversing camera with guidelines can also make light work of lining up your tow-ball and trailer with great accuracy. This big, brash American pickup, with a factory-approved RHD conversion by HSVaffiliate American Special Vehicles and sumptuous six-seat leather interior, is designed primarily as a heavy duty tow vehicle and it's exceptionally good in this role. A massive ladder-frame chassis, 3577kg kerb weight and 3797mm wheelbase provide an ideal towing platform, powered by a huge Cummins 6.7 litre in-line six cylinder turbo-diesel with 276kW and a towering 1084Nm of torque. This bulldozer-grade engine, which also features a powerful exhaust brake, is matched with an intelligent six-speed automatic transmission, 4x4 drivetrainand electronic stability controls all tailor-made for extreme duty towing. How extreme? We're talking a maximum braked towing capacity of almost 7.0 tonnes (6989kg) and it can carry its full 913kg payload while doing it. 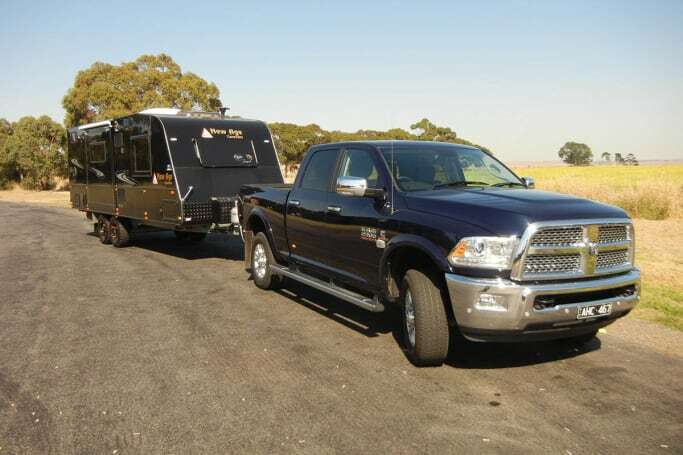 So, if you've got something big to tow, like really big, the 'Aussie' RAM is a luxurious and effortless way to do it. 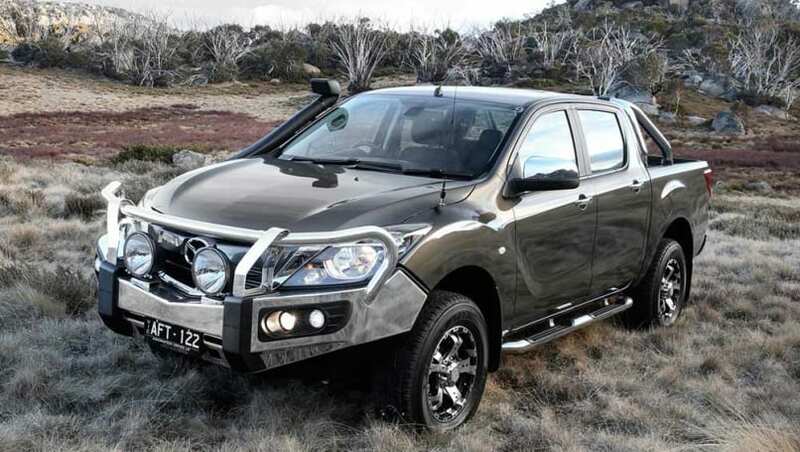 There are several reasons why this locally designed and developed dual cab is such a popular and capable tow vehicle. It's got a loping, low-stressed 3.2 litre five cylinder turbo-diesel with an ample 470Nm of torque, an intelligent six-speed automatic with sequential manual shift option, a suite of electronic stability aidsincluding trailer sway control, a relatively short reach between rear axle and tow-ball, a hefty kerb weight of more than two tonnes and a generous 3220mm wheelbase which is the longest in its class. 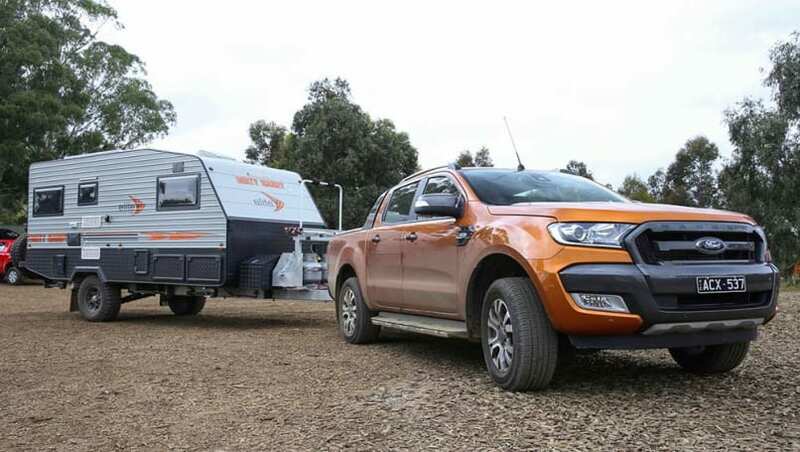 As a result, the Ranger boasts a 3200kg GVM and is rated to tow up to a benchmark 3500kg of braked trailer, even though many owners will never need to use it. If you do, keep in mind you have to reduce payload by a substantial 700kg to avoid exceeding its 6000kg GCM. However, tow 3000kg and you only have to reduce payload by 200kg. You know the drill. The BT-50 proves that beauty is more than skin deep. Under that polarising exterior Mazda's dual cab shares much the same DNA as its Ranger birth twin, which means you can own one of the best towing utesin the country at a lower price than its Ford equivalent. Although it didn't share in some technical upgrades that came with the Ranger's(PXII) mid-life update, it's still a very capable tow vehicle as it shares the same 147kW/470Nm 3.2 litre five cylinder turbo-diesel engine, intelligent six-speed automatic with sequential manual shift, electronic stability aids including trailer sway control, long 3220mm wheelbase, short rear axle to tow-ball reach, 3200kg GVM and 6000kg GCM with the same class benchmark 3500kg braked towing capacity. The smiles on the faces of many BT-50owners suggest they know a towing bargain when they see one. Holden's long-awaited mid-life makeover of its Colorado ute last year resulted in a more refined vehicle. It really should have been that way in the first place, but it's better late than never because such noticeable reductions in NVH (noise, vibration and harshness) have allowed the Colorado's inherent strengths as a tow vehicle to really shine. These include a kerb weight of more than two tonnes, a 3095mm wheelbase, short rear axle to tow-ball reach and 3500kg braked towing capacity. 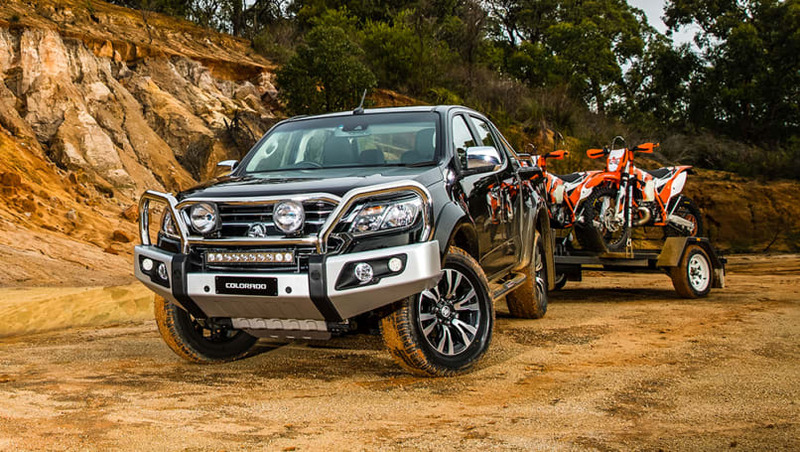 The more refined version of its 2.8 litre Duramax turbo-diesel four cylinder matches the larger capacity Ranger's147kW, but trumps it on torque with a class-leading 500Nm. The intelligent GM six-speed automatic is excellent for towing and a quick thinker too, as it enthusiastically starts downshifting to assist with engine braking as soon as it detects pedal braking on descents. We reckon the continuing market leadership of the HiLux is based more on its 'unbreakable' reputation and safe-as-houses resale value than for any great technological innovation or advance. Toyota did just enough with the eighth generation of Australia's favourite ute to catch up with the competition rather than surpass it. And not everyone likes its looks. Even so, it still ticks most of the boxes on our towing wish-list including a smooth and refined 2.8 litre turbo-diesel four with 450Nm of torque, a 3085mm wheelbase, kerb weight of more than two tonnes (SR5 auto), a good rear axle to tow-ball reach and trailer sway control. The intelligent six-speed automatic is well matched to this engine with a sequential manual shift option and a 'power' mode which with the push of a button provides extra towing grunt when required. Important to note that maximum braked tow rating with the auto transmission is 3200kg, which is 300kg less than the manual's benchmark 3500kg. That's a free kick for the competition, but the latest HiLux still gets the job done in that typically bland but efficient Toyota way. 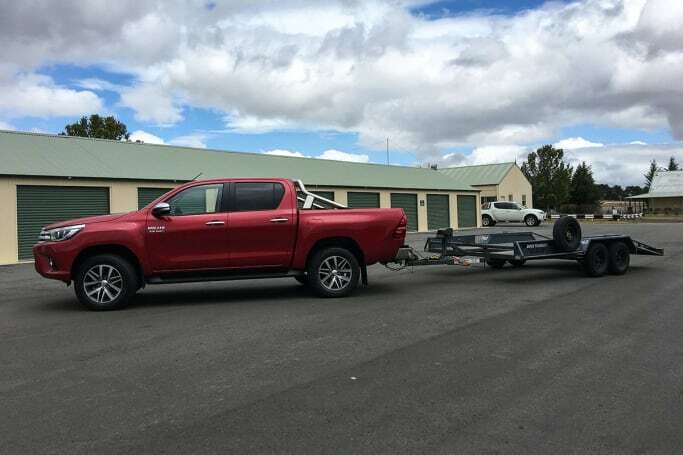 If you need to tow regularly and a dual cab ute just doesn't suit your requirements, remember there are also full-size 4x4wagons like the Nissan Patrol, as well as the Toyota LandCruiser 70 Series and 200 Series that can provide comfortable and spacious towing platforms rated to tow up to 3500kg with consummate ease. One of the great advantages of a 4x4wagon is that a lot of luggage and equipment can be stowed securely and out of the weather in the large cargo area behind the rear seats. Or, with a third-row seating option, they can carry up to seven occupants if required. It's just a matter of carefully weighing up if a ute or a wagonbest suits your needs and lifestyle.